The legendary home of IU basketball has undergone major renovations in the last year. The beautiful Simon Skjodt Assembly Hall now truly represents the greatness that is Hoosier hoops. Think of Indiana University basketball and you picture candy-striped warmup pants. You think of the five national championship banners, Martha the Mop Lady, and the William Tell Overture at the under-8 minute timeout. You think of Branch McCracken, Bob Knight and most recently Tom Crean. You remember the last undefeated college basketball team in history, the 1976 Indiana Hoosiers. You think of one of the most iconic, blueblood, elite college basketball programs in America. And you think of Assembly Hall. For 46 years, Assembly Hall has been one of the most revered basketball arenas in the country, a place where the Hoosiers have won 84 percent of their games and where crowds of 17,400 rabid fans have made the arena a daunting atmosphere for opposing teams. Indiana home games have always been a tough ticket and there continues to be a waiting list for season tickets. The best chance to see Indiana play in Assembly Hall is to buy either a three-game or six-game package that is offered for games played when the students are gone for Christmas break in late December/early January. IU has the largest student section in the nation in Assembly Hall, boasting 7,200 seats and when students are on break there’s a much better opportunity for fans to see IU play. A three-game package in the main seating area runs $132 per adult. A six-game package is double that at $264. Some think that’s a small price to pay to see games in the iconic arena. As the venue has gotten up in years, however, and with other schools building new, sterile, state-of-the-art arenas every year, the question of what to do with Assembly Hall has loomed large. Rebuild or renovate has been a question asked in Indiana circles since the mid-1990’s. Ultimately, the decision was made to preserve IU’s rich history in the building and give Assembly Hall a much-needed face-lift. Eighteen months and $45 million dollars later, the new-look Assembly Hall debuted in time for the start of the current 2016-17 basketball season. “I am thrilled that this project will preserve the best home court advantage in college basketball while also greatly enhancing the total game day experience for every fan, player, coach and visitor,’’ said IU Director of Athletics, Fred Glass, the day that IU broke ground on the new building. Indiana coach Tom Crean said that Assembly Hall is vital to the future of the Indiana program. And it’s not just the IU men’s team that is benefiting from the Assembly Hall facelift but the women’s program under the direction of Teri Moren, too. While there’s a waiting list for season tickets for IU men’s basketball, fans of the women’s game can get season tickets that are $42 for 14 home games, or $3 per ticket. Fans over age 65 and under age 18 can get the same package for $1 per game. Many believe the Indiana women’s team is clearly on the upswing and fans have a chance to get in on the ground floor. Don Fischer remembers fondly the dedication game he attended at Indiana’s Assembly Hall in its inaugural season in 1971. Bob Knight was in his first season as the Indiana coach and Digger Phelps was making his debut as the head coach at Notre Dame. The teams met on Dec. 18 in IU’s new basketball facility. Fischer has been the play-by-play voice of Indiana football and basketball for 44 seasons, beginning with the 1973-74 basketball season. But that game, he attended as a spectator. “All I remember is how magical the entire arena seemed back then and then two years later I found myself broadcasting in that facility. Chuck Crabb is in his 41st season working for IU Athletics. His current position is Assistant Athletic Director for facilities. He is probably best known for being the public address announcer for Indiana basketball for the past 40 years. Chills have been known to run down the spines of IU basketball fans when Crabb announces “Your Indiana Hooooooooooooooooosiers!” Crabb was a junior at Indiana in 1971 when Assembly Hall opened its doors. He remembers how Assembly Hall was the final structure that trumpeted athletics’ relocation from the center of the Bloomington campus (7th Street) to the current athletics footprint that is bordered by 17th Street to the south, the bypass to the north, Dunn Street to west and Fee Lane to the east. 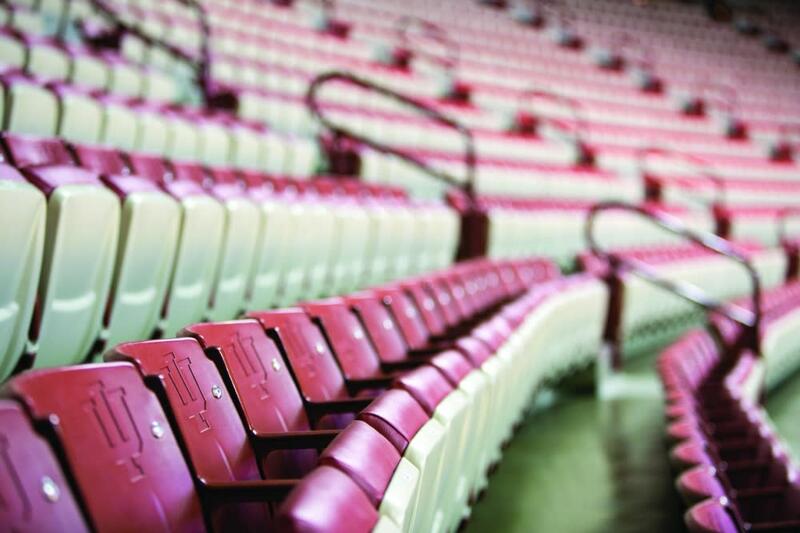 For the most part, the first 45 plus years of Assembly Hall came and went with very few changes. The arena got a new basketball floor in 1976 and again in 1995. In 2005, it got a new $1.99 million scoreboard/video board. But the changes to that point were very cosmetic. That changed with the current renovation. Thanks to a $40 million dollar gift from alumna Cindy Simon Skjodt, Indiana was able to renovate rather than rebuild. In honor of that landmark gift made by Simon Skjodt and her philanthropic organization, IU announced in 2013 it would rename Assembly Hall the Simon Skjodt Assembly Hall. In addition, athletics received a $5 million dollar gift from IU alumnus Mark Cuban to establish the Mark Cuban Center for Sports Media and Technology that will be housed on the west side of the Simon Skjodt Assembly Hall. The renovation was able to blend the old with the new in the arena. From the outside the most significant change is to the south lobby that has received an extreme facelift. On the interior, floors have been replaced, concession stands and restrooms remodeled, and escalators added. The old zig-zag ramps, however, will still be used but only in the north lobby. Except for the bleachers at court level, all the seats in the arena have been replaced and all are now red. The only part of the seats that was not replaced was the cast iron arm rests. A few seats were removed to accommodate changes in press seating but there won’t be a noticeable difference in the arena’s 17,400-seating capacity. The Hall of Fame portraits that once hung in the lobby have been digitized and adapted into an interactive display in the south atrium. Assembly Hall also has a new video board that is three times wider and has all the bells and whistles so that fans can enjoy better replays. “There is a significant wow factor when people walk into that building,’’ Crabb said. 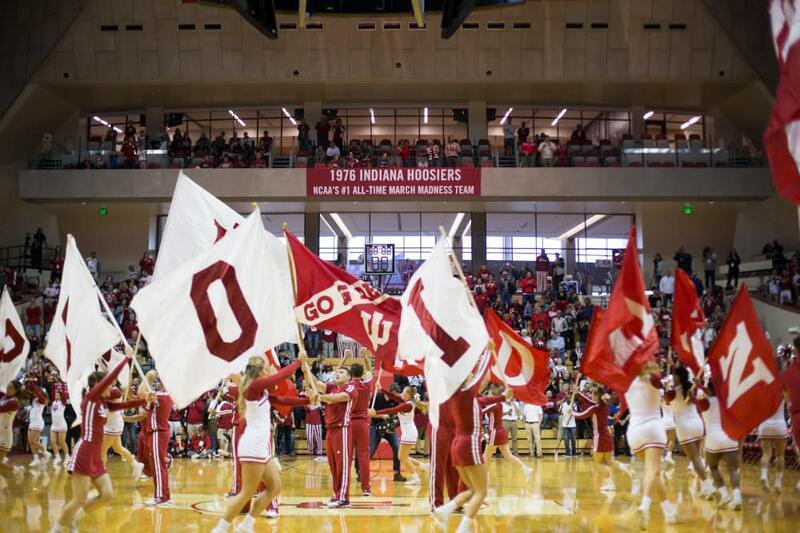 “It’s entirely different than what they experienced for the first 45 years of the Assembly Hall.’’ Crabb said it only takes a moment for fans to realize the difference when they enter the south lobby. Terry Hutchens has covered Indiana University football and basketball for the past 19 seasons and is currently the IU beat writer for CNHI Sports Indiana. Terry has also worked for the Indianapolis Star and Scout.com as the site publisher for AllHoosiers.com. Terry has been honored as Indiana&apos;s Sportswriter of the Year five times. He has written nine books, eight on IU topics, including his first IU Basketball Children’s Book titled Hoo-Hoo-Hoo Hoosiers! that was released in the fall of 2016. Other titles by Terry include So You Think You Know Indiana University Basketball, So You Think You Know Indiana University Football, Missing Banners, Hoosiers Through and Through, Rising From The Ashes: The Return of Indiana University Basketball, Never Ever Quit, Hep Remembered and Let &apos;Er Rip. All of Terry’s books are available at www.TerryHutchensPublications.com. Terry is also an adjunct professor at IU Bloomington in the Media School. Terry and his wife Susan live in Indianapolis and have two grown sons, Bryan and Kevin. 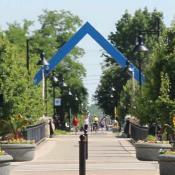 Visit Bloomington loves having local experts provide insights via the Backstage Blog. We hope you enjoyed it too.